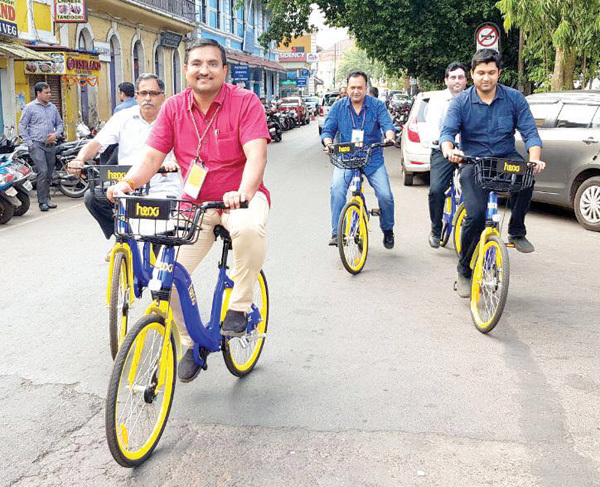 PANJIM: The first pilot public cycle sharing system was launched on Monday in Panjim under the smart city initiative. “This is a pilot project for which two cycle stands have been set up, one at old secretariat and other one at old PWD offices at Patto, both Serendipity Arts Festival venues. Public feedback will be obtained after each ride,” EDC Chairman Sidharth Kuncalienkar said. He said, “After analysing, the final bike sharing system will be set up for entire Panjim city and I request all citizens of Panjim to try the new system and give feedback.” Chief Minister Manohar Parrikar had taken a pledge for the cause of environment protection in Goa due to the increasing levels of pollution and with urban areas turning into a massive concrete jungle. Hero Cycles, a subsidiary of The Hero Group, headed by the Munjal family, made a presentation to the Chief Minister and Imagine Panaji Smart City Development Limited officials.